What Is This Thing Called Google Glass? Wearable devices are a hot new area of computing, and companies are scrambling to create computers that you can wear on your wrist (called smartwatches) and computers that sit on your head like eyeglasses (called wearable computing glasses). In the case of wearable computing glasses, Google recognized that seeing is the most natural way of consuming information and that computing technology has become small enough for a computer to fit within the frame of a pair of glasses. Google created a small screen that pairs information with what you see in the natural environment, as shown. What’s more, it developed an operating system that understands your voice commands so that you can perform tasks without using your hands, arms, or neck. Thus, Google Glass and the market niche of wearable computing glasses were born. Glass was a media sensation from the time it was announced, but despite all the hype (both good and bad), the mission of Glass hasn’t changed: to deliver information as quickly and conveniently as possible with cutting-edge technology. Google Glass comes in five frame colors — charcoal, tangerine, shale, cotton, and sky — so you can match your Glass to your personality. 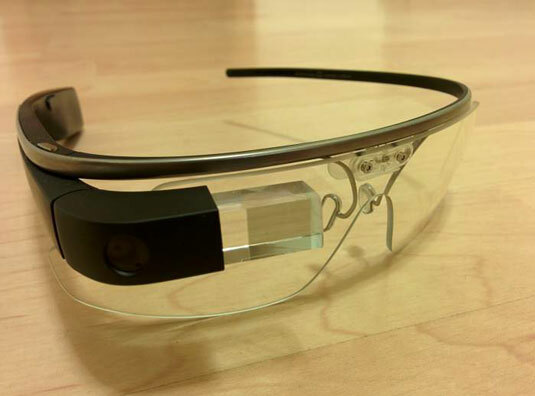 Google provides clear and shaded protective shields with Glass. The clear shields protect your eyes from the wind and other elements, and also make your Glass look like any other pair of glasses. The shaded shields reduce ambient light so you won’t squint outside on a sunny day. At this writing, prescription shields have also been announced for Glass. You can search for Google Glass prescription to see what prescription lenses are available. Before you buy, talk with your optometrist to find out whether using Glass with prescription lenses is right for you.